Now the heart-changing volumes can be found in one hardbound and collectible edition. Every great movement of God is preceded by a season of humility and repentance: brokenness. You will never know real joy, peace, or success until you learn what it means to live a fully surrendered life, and have a conscious ambition and aim to be holy. 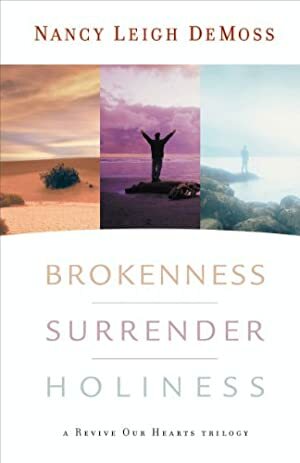 Nancy Leigh DeMoss's life message, with probing questions and application, will be the starting point for giving God the right to revive, control, and purify your heart. Log In to track Nancy Leigh DeMoss on eReaderIQ. to be notified each time the price drops on any book by Nancy Leigh DeMoss. to stop tracking Nancy Leigh DeMoss. We started tracking this book on October 21, 2011. This book was $8.69 when we started tracking it. The price of this book has changed 25 times in the past 2,738 days. The lowest price to date was $4.42 last reached on November 28, 2015. This book has been $4.42 one time since we started tracking it. The highest price to date was $14.84 last reached on December 13, 2017. This book has been $14.84 one time since we started tracking it.